I get it now. I get why people from the BBQ capitals of our country bemoan the state of BBQ in places other than their own. I didn't understand it at first, this BBQ snootiness. I figured that it was just the pride talking. I was even willing to bet that if you blind-folded and served them, say, ribs from our local Lucille's chain back at their home and didn't tell them where it was from, they'd like it just the same, they wouldn't be able to tell the difference. But after having the Memphis-style ribs at Corky's during a recent trip to The Mid-South, I now see the light. 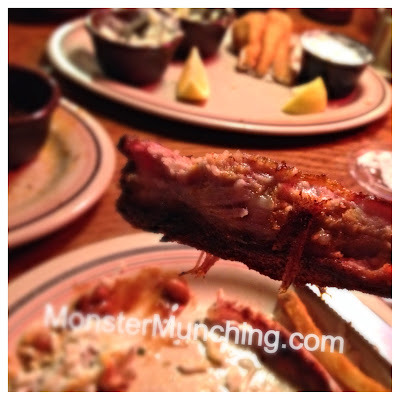 The minute I sank my teeth into the first rib, I actually said, "Oh my God." These were ribs unlike any I've ever tasted in my life. It was covered in a dry rub, not glopped in sauce, a caking of spices that amounted to breading. I've had dry-rubbed ribs before. It's not new to me. But this was the first time the seasonings actually sang. It crackled and snapped in my mouth, as though it were made of Pop Rocks. And then there was the texture of the pork itself. On the outside, it was crunchy-crisp, something akin to fried pork skin. But underneath the meat was nearly liquid, an amalgam of melted fat and tender pink flesh--a surge of porky sweetness so thrilling it's orgasmic. I realized then that I didn't just eat the best BBQ ribs of my entire existence; I also just ate one of the best pork dishes in the world, second only to Magic Wok's sisig. 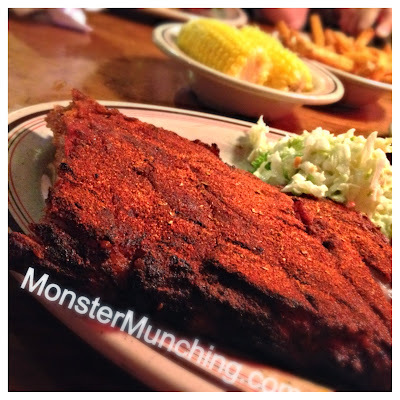 Corky's ribs are already beloved by the people of Memphis. So this post will sound to them as though I just saw the Star Wars trilogy for the first time or figured out who this bloke Elvis** was. Incidentally, Memphis is primarily famous for two things: Elvis and BBQ. But here's how serious they are down there about BBQ: there was a friggin' drive-thru at Corky's. Yes. The restaurant had a drive-thru--a drive-thru I'd be queuing up to, like, every single day if I lived there. **Side story. Here's a recent conversation I had with a young co-worker who grew up in India. So what are you doing Memorial Day Weekend? Elvis Presley? The King of Rock and Roll? You don't know who Elvis is? No. Does he still live there? I won’t deny that the lure of the Mickey Mouse pancake and/or waffle is great. When you’re at Disneyland during breakfast hours, these items are programmed into your cerebral cortex. I don’t know if it’s because of the artificial vanilla scent the candy shops pump into the air, or the fact that I know they exist, but I am not immune to their pull. Every time I’ve gotten to the park early enough, I’m at the Carnation Café ordering some Mickey waffles. But the breakfast item I should’ve been ordering all along at Carnation are the Huevos Rancheros**. These, I discovered, are the greatest things to eat at Disneyland first thing in the morning. Disney has hit it out of the Park (get it?) with this one...like, towards Santa Ana. In it poached eggs are smothered in a fire-roasted salsa with bits of corn and avocado, the whole thing served over a puddle of creamy black beans and lashed together with melted cheese. Beneath it and stuck upright in the middle are freshly fried corn tortilla disks that, if you eat it a certain way, makes it taste like a breakfast tostada. It’s filling, of course, but not heavy. You leave feeling energized either by the carbs, the wholesomeness, or the fact that you just found something even better than any Mickey-shaped foodstuffs. 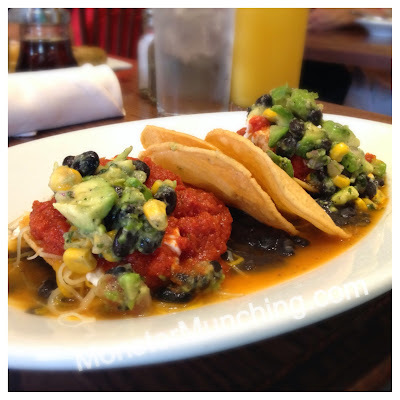 **UPDATE: As of Memorial Day 2014, Carnation Cafe stopped serving the Huevos Rancheros. If anyone knows where this dish has now migrated to in the Magic Kingdom, drop me a line. At Aioli--a stall at the same Irvine food court which also houses Thai & Chinese Express--there's a twenty-something-ish dude who makes one of the best chicken Marsalas I've ever had. I know he's singularly responsible for the dish because he's always the only one there whenever I pick up my order. Sometimes, if I forget to call ahead, he'll go to the kitchen after taking my money, and for the next ten minutes I hear something sizzling and sauté pans clanging as he cooks the order himself. Come to think of it, I'm pretty sure this man is the owner--the person their website identifies as one Jordan Mullikin. Mullikin opened Chicago's Best in this very spot a few years ago, but then rebranded it Aioli so that he can cook dishes like, well, like the chicken Marsala and other things that don't quite fit under the Chicago food umbrella. "After seven years of building and owning Chicago's Best, Jordan realized that this was not what brought him satisfaction. He wanted to create and have fun cooking again. This is when he decided to change the restaurant's name and recreate his company focusing on what he loves, sauces!!! ", the website says. And what a sauce his Marsala is! It stings warmly of wine, and possesses a savory sweetness so good you'll want to squeegee every precious drop with your finger. 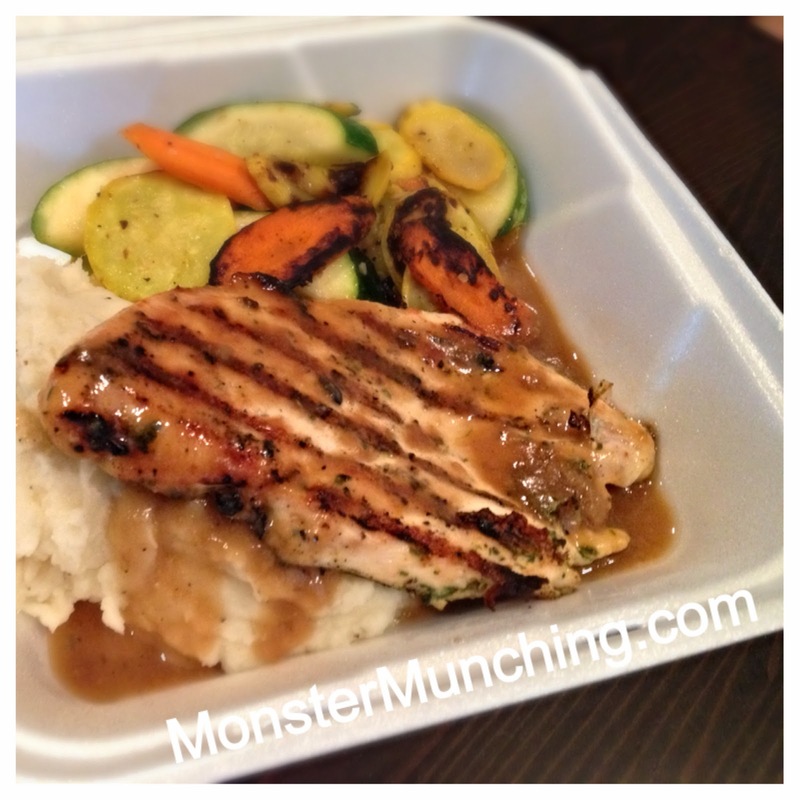 I would argue that there's no better chicken Marsala than this, despite being served in a foam container. And best of all: it's only about $8. The mashed potatoes tastes as though someone actually hand-mashed it with lots of butter; the chicken is perfectly cooked, juicy throughout; and the zucchini and carrots are still crisp-tender. Great food court food is not a myth. And finding both Thai & Chinese Express' pad see ew and Aioli's chicken Marsala here is like running into Big Foot and Loch Ness Monster hanging out together at your favorite bar. Listen. Do you want to know a secret? Do you promise not to tell? Let me whisper in your ear: Al Fresco Lounge in Disney's California Adventure is the best place to eat inside the Happiest Place on Earth. You might not have even heard of it. 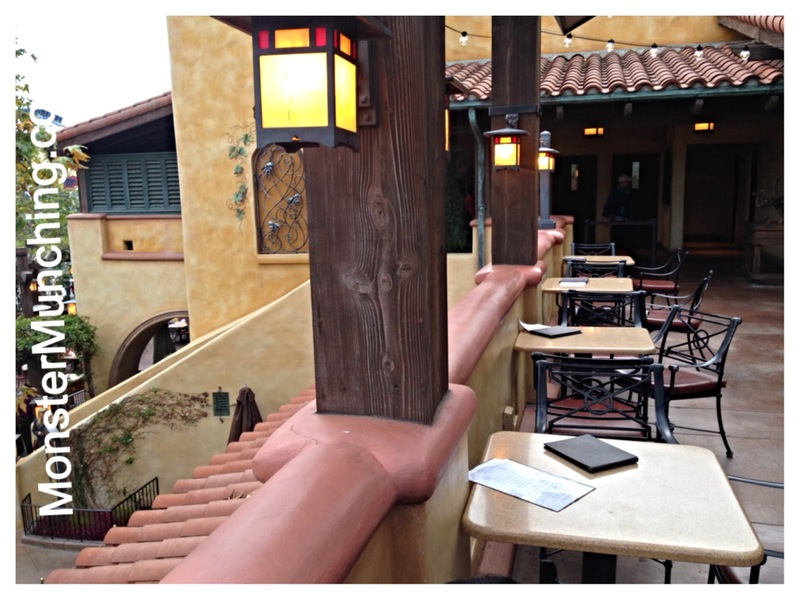 The place is usually offered as the consolation prize when the Wine Country Trattoria is all booked-up. But the lounge is where you want to be regardless. The prices are reasonable; the food is good; and it has always been there, listed on the park map, waiting to be discovered. The fact that nearly no one is aware of its location--hidden away above the hot sweaty mess of Cars Land--makes it special. This is an oasis of calm in desert of fanny packs and screaming children. It's literally tucked into the treetops, cooled by wayward breezes, and shaded by leafy trellises. It doesn't serve full meals, only appetizers from a bar menu, but this includes grilled shrimp atop a blubbery polenta cake; a perky interpretation of caprese; and the $10 fritto misto, a mountain of lace-battered calamari, mussels, green beans, and artichoke hearts with pepperoncini aioli and a spice-dabbed lemon wedge. 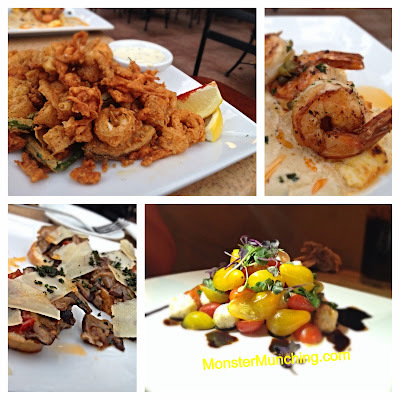 This fritto misto would be considered excellent even outside Disney, and enough for one person's dinner. Order it and then sink into a couch while slowly sipping a dry cab or a cocktail with glowing ice cubes. Heck, just cool yourself down with a chilly Coke topped off for free for as long you care to sit around. Even plain ice water tastes better up here. So go! Enjoy! But shush! Let's keep this place our little secret, mmm'kay?